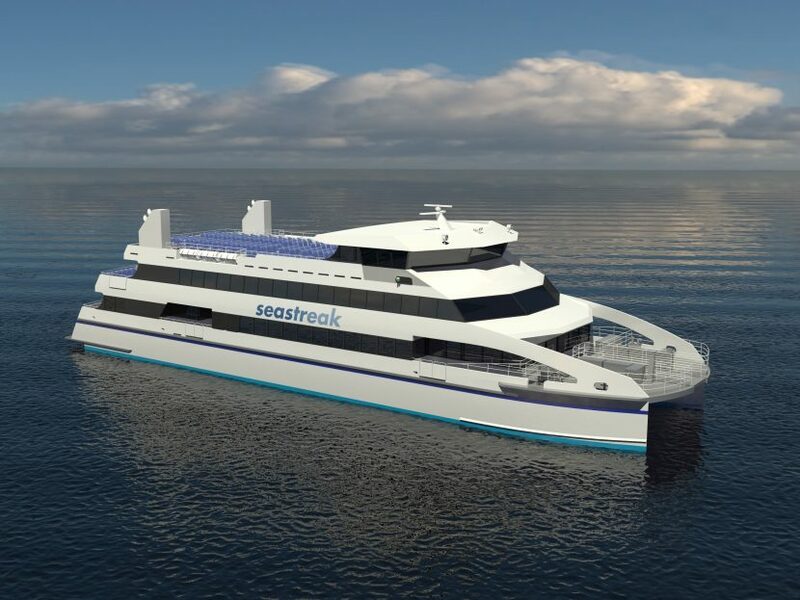 Seastreak is proud to announce that we will be raising the bar in fast passenger ferry service with the construction of a new six hundred passenger, high-speed, luxury catamaran with delivery expected late in 2017. Our newest vessel, the first in what will be known as the Commodore class, is being designed by Incat-Crowther of Sydney, Australia, will be constructed by Gulf Craft of Franklin, Louisiana, and will be the highest passenger capacity USCG K-class high-speed ferry in the United States. Our new Commodore-class 35-knot ferry will continue to offer the fastest available waterborne transportation option, providing service between Wall Street and Monmouth County, New Jersey in under 40 minutes. The new vessel is designed around four MTU 12V4000 high-horsepower-series diesel engines, offering the lowest emissions on the market, driving four top-of-the line Rolls Royce waterjets providing reliability as well as redundancy. The interior will be arranged in a similar manner to our existing vessels but on a larger 150′ platform and a wider 40′ beam. The hulls will feature a cutting edge design for even greater stability. The pilot house will be located on the third deck, offering enhanced passenger visibility from the second deck. The vessel will feature all the high-end comforts you have come to expect from Seastreak and more, including the latest in luxury seating, panoramic windows, beautiful interior design featuring all-LED lighting, flat screen TV’s viewable from any seat, multiple dedicated charging stations, Wi-Fi, and high-tech HVAC systems. The passenger seating arrangement will consist of 520 interior seats with an additional 206 exterior seats located on the second and third deck. There will be seven restrooms located inside the vessel along with ADA compliant accommodations. The exterior boarding station doors and gates have also been increased in size to increase the overall flow of passengers embarking/disembarking the vessel. In addition to the new vessel, we are moving forward with our plans to upgrade and repower three Seastreak class vessels (Highlands, New York and New Jersey) over the next several years, with the Seastreak New York going into the shipyard this winter. We will be replacing the vessels’ engines and water jets with modern tier 3 MTU 16V4000 series engines driving Rolls Royce water jets. This new engine and jet configuration will not only be cleaner burning, and better for the environment, but will also remove approximately 20 tons of weight, helping greatly with speed, and efficiency. These upgrades will also involve new custom seating, windows, and carpeting, as well as other mechanical upgrades. We plan to upgrade and repower one vessel per year each winter. The new Commodore-class vessel, together with improvements to the Seastreak-class vessels, will require the investment of more than $24 million dollars. These investments reflect our continuing commitment to our customers, and ensures that you will enjoy a modern, reliable and comfortable ferry fleet for many years to come.